The Common Core State Standards (CCSS) call for students to “read widely and deeply from among a broad range of high-quality, increasingly challenging literary and informational texts.” Great Books programs, which include anthologies of high-quality literature, help teachers provide a “staircase” of increasing text complexity so that students develop their reading skills for the more difficult texts they will encounter in college and careers. The ability to read increasingly complex text is the best predictor of achievement among college freshmen, better than critical thinking alone (ACT, 2006; Liben, 2010). The Great Books Foundation’s K–12 programs are based on the belief that, with well-researched, inquiry-based support activities, all students can comprehend, discuss, and interpret complex texts. To select the literature for its anthologies, the Foundation uses criteria that not only mirror the Common Core criteria for determining complexity, but go beyond them. 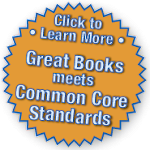 This paper will explain the Common Core’s definition of text complexity, the Great Books Foundation’s criteria for selecting texts, the role of Lexile scores in the selection process, and the routine of collaborative activities that support students in comprehending and interpreting challenging texts. How is text complexity defined by the Common Core State Standards? Appendix A of the CCSS (CCSSO, 2010) uses qualitative, quantitative, and contextual criteria for determining the difficulty of a text, as represented in the graphic below. The qualitative dimension of text complexity refers to characteristics of a text such as levels of meaning, structural complexity, and language conventionality and clarity. This dimension is determined by professional expertise and common sense. A story with multiple plot lines is more complex than one with a single plot line; a story with flashbacks is more complex than one with a sequential structure; and a story with unfamiliar dialects is often more complex than one with only standard English. The quantitative dimension of text complexity refers to a numerical score determined by an analysis of text features such as word frequency and sentence length. While there are numerous text analyzer tools, the CCSS uses Lexile scores for establishing ranges, or “bands” of measures for various grade levels. Appendix A emphasizes, however, that quantitative measures are not the only indicators of text complexity. For example, texts with common words, shorter sentences, and more dialogue may have low scores but actually be very challenging due to their qualitative characteristics. Reader and task refers to characteristics of individual students and the activities teachers choose to guide their learning. Background knowledge is very important to text comprehension, and each student has a different set of knowledge and experiences. Readers also bring their own set of interests to each reading experience. Teachers must consider the cognitive capabilities students need in order to read and carry out other activities with the text, the degree to which students will be motivated to engage with the text, and the vocabulary and content knowledge required to successfully navigate the text. Evaluating text complexity involves an in-depth consideration of each of these three dimensions, with extra weight given to professional experience and the individual context (Hiebert, 2013). Great Books editors give each piece its due weight and often consider additional criteria, such as the inferences required by the text and how unfamiliar vocabulary is treated in the text. Careful attention is also paid to the placement of each selection in the anthology based on its qualitative aspects. Finally, each text is evaluated in light of the specific tasks and activities that we recommend in Shared Inquiry (see table below). *From CCSS: Appendix A (2010). What qualitative criteria are used to select texts for Great Books Programs? All Great Books texts meet a set of rigorous criteria that includes both quantitative and qualitative measures. The criteria must be rigorous because a primary goal of Great Books K–12 programs is not only to develop reading skills, but to develop critical thinking skills through reading and discussion. The Foundation’s programs use a method of reading and discussion known as Shared Inquiry, in which students collaborate on a number of activities to closely read, analyze, and interpret a particular text. Because Great Books texts must sustain students’ interest over several sessions and also raise genuine questions of meaning, the qualitative criteria for selecting texts extend beyond those advocated by the CCSS. Selections must support extended interpretive discussion. Because Shared Inquiry discussions call upon participants to develop ideas about the meaning of the text and support them with evidence, a story that has an explicit message or too little content to back up ideas is not suitable. Selections must raise genuine questions for adults as well as students. Because teachers collaborate as participants in Shared Inquiry, the texts must be intriguing to them. Selections must be limited in length. Because Shared Inquiry requires repeated work with a text and familiarity with its details, it is ideal if a text can be read in one class period. Selections must be age appropriate. Because Shared Inquiry is about the discussion of ideas, texts chosen for a designated age group must be engaging, relatable, and appropriate for a particular age group’s level of maturity and life experience. Selections must be well-written. Because students read a Great Books text several times, and much of a story’s meaning depends on how the words are interpreted, texts should use rich language and be examples of excellent writing. A text can be of high quality and still not be selected depending on factors such as theme and diversity of genre, gender, and ethnicity. In fact, the average rejection rate for story selection at grades 2–5 is over 90%. What quantitative measures are used to select texts for Great Books programs? As stated in the CCSS, Appendix A (CCSSO, 2010) quantitative measures are a useful though sometimes unreliable dimension of text complexity. Great Books editors use Lexile analyzer tools because a majority of schools and libraries use Lexile scores to match individual students with texts of an appropriate level of challenge. The Foundation provides these quantitative scores for each selection to give teachers an idea of vocabulary and sentence structure. In Great Books programs, the Lexile score of most texts falls within the stretch range of the grade for which it is designated. In cases where a text has a Lexile score outside the given range (lower or higher), the editors have carefully examined the text’s qualitative aspects, as well as its accessibility and relevance to its intended readers, and determined that it is appropriate for its designated grade level. In addition to providing high-quality complex texts for students to read, Great Books programs address a major concern of teachers: How will I support my students in reading and understanding challenging texts? All teacher’s materials for Great Books programs provide instructions for a routine, or “sequence,” of activities. These collaborative activities are designed to support students in comprehending and interpreting challenging texts and to teach them the habits of highly skilled readers. Carefully crafted for each particular text, the activities set a purpose for reading, build skills, and foster motivation. There are activities to help teachers provide their students with content knowledge, as well as activities that build vocabulary and strategy skills, provide motivation to exert effort, and increase comprehension and higher-order thinking. Taken together, these components of literacy instruction are the best ways to support students as they approach challenging texts (Shanahan, Fisher, and Frey, 2012). Throughout each Teacher’s Edition, examples of teacher-student dialogue and suggestions for differentiation help teachers develop their students’ reading, discussion, and critical thinking skills. Because Great Books texts raise intriguing and meaningful questions for them to grapple with through collaborative activities, students are motivated to stretch and work with more complex material than they might on their own. National Governors Association Center for Best Practices, Council of Chief State School Officers (2010). Retrieved November 14, 2013 from Common Core State Standards for English Language Arts & Literacy: Appendix A.
Hiebert, E. H. (2013). Supporting Students’ Movement Up the Staircase of Text Complexity. The Reading Teacher, 66(6), 459–468. Liben, D. (2010). Retrieved January 3, 2014, from Why Complex Text Matters. Aspects of Text Complexity Project. Shanahan, Fisher, and Frey (2012). The Challenge of Challenging Text. Educational Leadership, 69(6), ASCD. Mark Gillingham is a senior researcher at The Great Books Foundation.